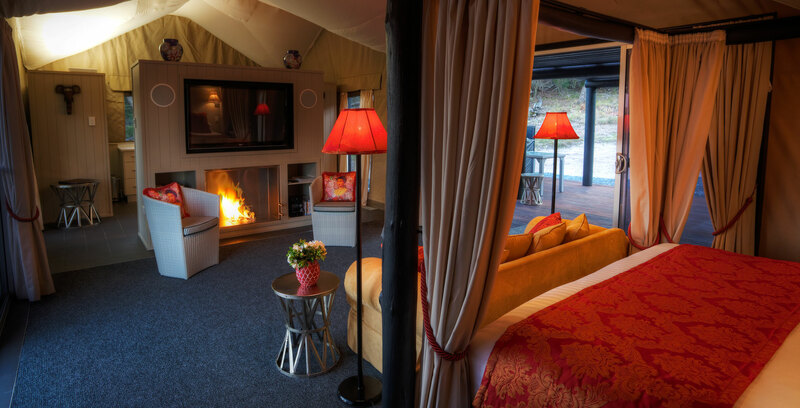 Experience Australia’s most romantic and luxurious glamping experience in our fully self-contained tent for the most discerning of guests. 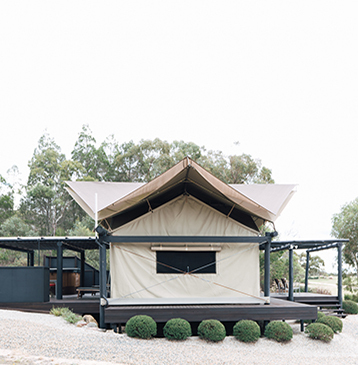 Glamping in Queensland’s Granite Belt is the most stylish, luxury camping you will ever experience! Our tent is complete with every convenience you could never imagine. We’re proud to be the first to bring this level of design and luxury innovation to accommodation in Australia. 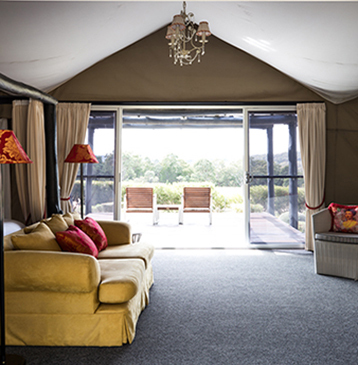 The glamping tent is a self-contained 56m2 African safari tent erected on a large timber deck. The stylish interior was lavishly created with the assistance of renowned Brisbane interior designer, John Glynn. The look is abject luxury with a hint of restrained rustic. Add to your stay with extra special pampering options including in-villa massages, gourmet breakfast platters, restaurant in-villa meals, or celebrate that special occasion with a romance or celebration package. The bedroom features a fabric draped four poster bed, complete with king sized pillow topped ensemble and luxurious bed linen. Cocoon yourself away and set the lights to suit your mood. No traipsing outside to the bathroom at Alure! 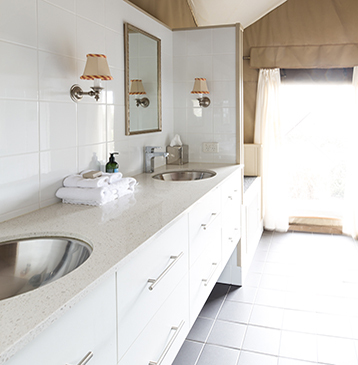 In true glamping style, the spacious ensuite bathroom is well appointed with L’Occitane toiletries, a hairdryer and GHD hair straightener. Bathe under the colours of the rainbow with the revolutionary, illuminated Hansa Clear Lux Duo shower system. You can be as relaxed or invigorated as you desire by your favourite hue! Dry off with the softest, fluffiest towels warmed by the heated towel rails for a cosy finish. We appreciate how important a fire experience is for our guests and the environmentally friendly, state of the art, EcoSmart fire won’t disappoint. 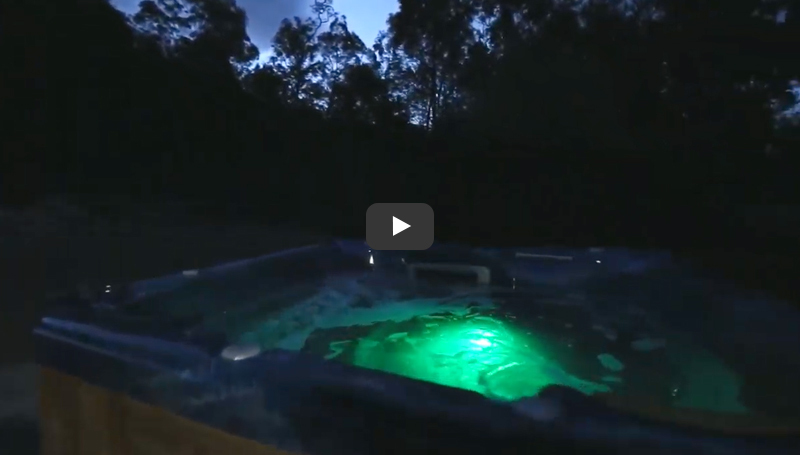 Perfect for anyone looking for Stanthorpe accommodation with a fireplace. The tent is insulated for your comfort. Rest assured there’s also ducted air conditioning for those rare moments. Stretch out on the lounge perfect for two. Savour the scenery, watch your favourite Netflix show on the 50″ Plasma, curl up with a magazine, make the most of free wifi, or nod off while listening to the stereo or your iPod. Cook up a storm in this stylish kitchen with quality European appliances, stone top benches, convection microwave, induction cook top, toaster, kettle, refrigerator, dishwasher, automatic espresso coffee machine and, of course; we provide seriously good coffee. Envelope yourself in nature! There are generous decks front and back, BBQ, and (of course) a private heated outdoor spa for soaking under the Milky Way. If you must …laundry facilities are included, with a washing machine, iron and ironing board. The Tented Villa is strictly non-smoking inside and outside. 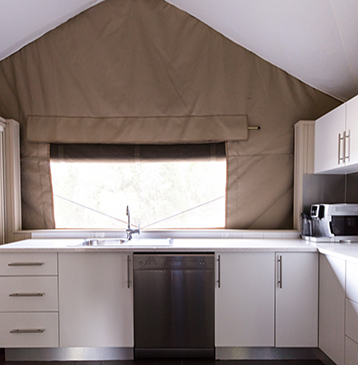 Architect designed, the tented villa has been insulated, designed and positioned for maximum passive solar efficiency. Rain water is captured and used throughout, with waste water recycled for use on the landscaped gardens. Water and electricity efficient fittings and appliances are used throughout the tent. It is surrounded granite rock and natural bush, providing a perfect haven for kangaroos, koalas, birds and other wildlife. Now, THIS is Alure’s version of camping!! !